Sorry. This item is sold out. 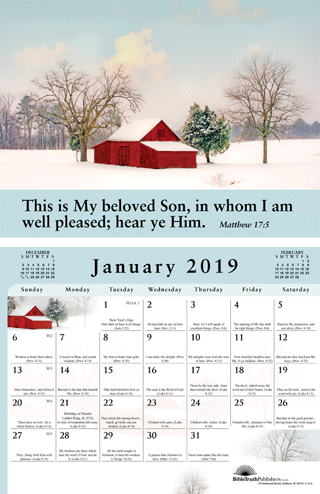 11" x 8.5' x .004"
11" x 8.5" x .1"
This version of this beautiful, high-quality appointment calendar provides large-print gospel verses with the picture for each month. Great for you to enjoy or to reach out to lost neighbors as a gift of your love to them. Other styles are available, and you can even personalize the calendar to meet your personal needs. Click here to see your options. To read the verses and enjoy larger images of each page, roll your mouse over the pictures above. 10 good reasons to personalize. Share the gospel with your contact email so others can respond. Add selected community information to improve retention rate during community outreach. Include local holidays or remove ones you don’t need. Create one for the family with anniversaries and other special dates. Add memory verses or selected extra gospel verses to individual days. Include gospel and Sunday School times to encourage more visitors. Include special offers for some weeks or months to encourage regular interaction with calendar recipients. Create prayer reminders for yourself or others. This envelope works well for Gospel of Peace calendars.